I went on a pilgrimage to San Francisco Japantown last Sunday to get bento supplies. While most of the things I purchased were very reasonably priced (even ridiculously cheap), this bento box was not. I saw it at the Sanrio store and fell in love with it. 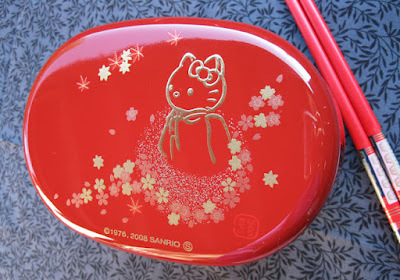 Japanese lacquer with gorgeous cherry blossom details, and the stylish gold Hello Kitty in partial profile. I had to have it! Do yourself a favor if you head to Japantown: print out this coupon for the Sanrio store. For this bento box lunch, I wanted to make something special. Cold udon noodles with steamed asparagus and zucchini, crispy pancetta, and black sesame seeds. I dressed the noodles with soy sauce, toasted sesame oil, and vinegar. In the lower compartment: a mandarin orange, cucumber slices, red bell pepper slices, a few salad greens, carrots, and half of a hard boiled egg with black sesame seed decoration. The asparagus, zucchini, and mandarin are from the Santa Rosa Original Certified Farmers Market, and the egg is from chickens raised by my coworker's daughter. Steam the asparagus and zucchini briefly in the microwave (no more than 1.5 minutes). Cook udon noodles according to directions on package. In a small skillet, cook pancetta over medium heat until crispy. Remove pancetta to a paper towel to drain, but leave rendered fat in the skillet. Cook onion and garlic in the skillet for about 1 minute, until fragrant. Add noodles to the skillet, and then steamed veggies. Toss to combine, and remove from heat. Add soy sauce, sesame oil, and vinegar. Gently toss to coat noodles. 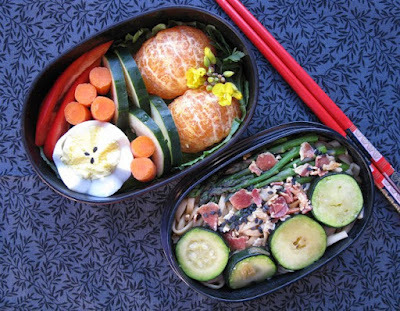 Place noodles in bento box (or in a bowl) and top with veggies. Top each serving with crumbles of pancetta and black sesame seeds. Makes enough for two bento box lunch servings.